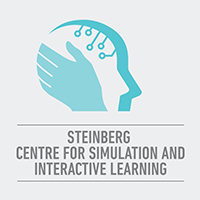 Established in 2006, the Steinberg Centre for Simulation and Interactive Learning is an interprofessional centre of excellence that uses medical simulation to enhance the skills of health care professionals. The Centre continuously strives to improve patient safety and quality of care through education, research, evaluation and innovation. The Centre combines training techniques from high-risk professions in aviation and emergency response with the latest medical simulation technologies. Fully integrated into McGill's professional programs, the Centre provides the next generation of doctors, nurses, physiotherapists and occupational therapists with hands-on training in difficult and potentially dangerous procedures without risk to patients. It also promotes the importance of teamwork in health care delivery. Established health care professionals are also able to take advantage of the Centre for the professional upgrading that will be increasingly required by licensing bodies. The Centre is a focal point for research in the field of simulation-based medical education with a mission to generate cutting-edge innovations in how we train our clinicians and engage with our community. The end result is a culture that is committed to professional accountability, critical assessment and life-long learning.